Alternative Investments: Should I Invest in Film Financing? Lionshare Partners > Blog > Alternative Investments: Should I Invest in Film Financing? Everyone loves the story of the film, produced for $750,000 by a handful of private investors (entrepreneurs, doctors and small business owners) with most of them contributing $10,000 to $20,000, that grossed $5,000,000 at the box office. Anyone who has produced an independent film will tell you the most difficult task is raising money to pay for the production (although the rest is not easy either). If you’ve never produced an independent film, it is almost impossible to raise the money for it outside of a friends/family round or by being fortunate enough to obtain intellectual property with a following (i.e., book rights, life story rights, etc.). One way “not” to raise money for an independent film, is to run around your town with a script and attachment letters and start taking money from people. Worse yet, take out newspaper ads for investors. This physically can be done, but the potential downside is jail. Read that twice. The penalties for violating securities laws when raising money for a movie can be criminal in nature, as well as civil. Accordingly, as fun as it is exciting as it may be to treat movie money like the wild west, it is not advisable. You can find money for a film in a million different ways and places. But lawyers can only participate in film financing situations that are in compliance with state and federal laws. Complicating the scene are the credit crunch and the precarious state of foreign pre-sales. The world’s film buyers are pickier than ever, and their offers are lower — and banks aren’t able to gap the shortfall. So, the pressure is on equity investors to foot the majority of a pic’s budget. Raising money is the key to any independent film, regardless of your position, experience, and past credits, and there are only a few ways to actually accomplish that. Being that a film finance closing can last anywhere from 4–12 weeks, this can be a relatively clean, straightforward experience, or three months of hell. Simply put, a finance plan is the best indicator of a producer’s financial I.Q. We need to know that you know how much money you really need and where you’re going to get it from. The new and first-time producer usually has to go the private equity route. The other financing methods usually depend on relationships and track records the producer has, which, if you’re a first-time filmmaker, you may not have. With larger budgets, equity usually covers 25%-60%. For lower budget projects under $5,000,000, equity usually covers 80%-100% of the budget. As an investor, you would be much happier giving a filmmaker a dollar knowing they can at least guarantee you 50 cents back from tax incentives and foreign sales and without carving out debt positions. Generally, for the lower budget indie film, producer is unlikely to get pre-sales, mainly due to the inability to attract pre-sellable cast at lower budgets. Therefore, if your budget is $500,000 and you have pre-sales in your finance plan, it’s a dead giveaway to the savvy investor that you do not know what you’re doing. Movies that are getting made have a substantial slug of equity in there. Certain equity partners would rather own the whole film than pay expensive debt costs. Unlike other industries, there are two discrete types of equity sales in the motion picture industry. The first is sale of securities in the film company. By selling stock in a corporation or membership interests in the LLC, the company raises funds by increasing the amount of equity owned by people other than the filmmaker. The manager-managed LLC or the limited partnerships are the more common investment vehicles for such project financing. The second form of equity financing involves selling the film’s distribution rights, which we will discuss later. Many independent filmmakers – including successful directors such as Spike Lee and Francis Coppolla – have used their personal funds to finance all or part of their films. There are no legal limits or restrictions on this practice. Despite the adage that a filmmaker should only spend other people’s money, personal funds are invariably part of the film financing mix. While there are many ways to structure these types of deals with many different ways for the investors to re-coup their investments and turn a profit, they all revolve around the same questions that must be answered: (i) How much ownership does the investor receive for the investment? (ii) How will the investor re-coup their investment? (iii) How will the investor’s see a profit? (iv) How much equity is the filmmaker putting in? Background checks of publicly available records will certainly help identify convicted felons and anyone cast out of the fully regulated sectors of the financial community. But are such willful miscreants really the source of most film litigations? The complexity inherent in film funding — typified by smoke-and-mirror accounting and “waterfall” recoupment schedules that seem to punish those taking the greatest risks — means cinema is always prone to borderline behavior and bare-knuckle negotiating tactics from all quarters. Therefore, it is imperative that you spend the money to consult with an attorney on any equity structure. Investors have been known to act against their better judgments, of course. In his chapter for the book, “Film And Risk”, prominent Los Angeles-based entertainment lawyer Bill Grantham recalls coming across projects that were so obviously flawed he begged clients not to get involved with them, sometimes providing detailed written explanations of exactly how they were going to lose all their money. They did it anyway — evidence of a psychological component to film investing that stretches beyond steely business calculation. Even the most coldly detached investor still needs to guard against common pitfalls. A film might be a roaring success, but because some investors chose to invest in the overhead and development costs of the production company in a “first-in, last-out” position, they may have lost out on windfall profits. Alternatively, investors may find themselves too far down the revenue sharing waterfall in a film whose budget over-runs have led its producers to stack new senior financing tranches on top of investors’ equity claims. Do You Need a Private Placement Memorandum (PPM)? The most common source of seed capital when starting a business is friends or family. However, in general, the amount that can be raised from friends or family is no more than $100,000. As such, a PPM is generally not required to raise capital from family members and close friends. A private placement (also known as unregistered offering) is a securities offering exempt from registration with the SEC. Production companies and film funds, will engage in private placements to raise equity or debt financing from a small group of select investors instead of the public, usually from institutional investors and high net worth individuals. In general, investing in private placements is risky: private placement offerings are not registered with the SEC; most private placement securities are restricted securities and can tie up your investment for a year or more; and most private placements do not have the same investor protections as registered offerings, such as the comprehensive disclosure requirements that apply to publicly traded companies. While there is some overlap, a PPM is not the same thing as a business plan. The detailed “description of the securities” and the “risks factors” are perhaps the most important difference between the PPM and a business plan. Unlike a business plan, the PPM focuses on the structure and terms of the deal, and the attendant risks of the investment, whether they be equity securities or debt securities. The PPM should be a descriptive document. It should allow readers to reach their own conclusions regarding the merits of the deal. A major downside of seeking money from non-accredited investors is the much greater disclosure requirements. On the other hand, in general, the legal disclosure burdens are dramatically reduced (subject to the antifraud provisions of the securities laws), when only accredited investors (earned income that exceeded $200,000 (or $300,000 together with a spouse) in each of the prior two years, and reasonably expects the same for the current year, or (2) has a net worth over $1 million, excluding primary residence) are involved. In which case, you may avoid using a PPM to raise funds. A Term Sheet is typically used for a negotiated transaction with a small number of investors. On the other hand, a PPM normally sets fixed terms the company wants, and which can be circulated to a relatively larger group of potential investors. Unlike the Business Plan, both the PPM and Term Sheet describe the deal. Both the Term Sheet and PPM define exactly what the investor is getting, who else is in on the deal and what percentages of the company is owned by them. However, unlike the PPM, a Term sheets does not have adequate warning about the risks of the investment. Risks factors in a Term Sheet would be a mere formality, since experienced accredited investors perform their own due diligence and risks assessment before they invest. If you want Hollywood to invest in your movie, don’t send them a PPM. Studios will usually finance a movie idea if it’s a proven concept or appeals to the biggest demographic. No amount of fancy disclosures about the market and sales predictions will make a difference. You don’t need a PPM to pitch your project to Hollywood or to obtain studio financing. Angel Investors and high-net individuals typically like to negotiate the terms of the deal with a term sheet. Once the deal is fully negotiated, the term sheet goes back to the company’s attorneys who use it to draft a subscription agreement or stock purchase agreement, LLC operating agreement, or other document establishing the rights and preferences of the investor. A PPM is not required for every capital raise. Rule 504 of Reg D provides an exemption from registration for securities offerings of less than $5 million within a 12-month period. A company may offer and sell these securities to an unlimited number of accredited and non-accredited investors. Under Rule 506(b), a company can raise an unlimited amount of money from an unlimited number of accredited investors, but from no more than 35 non-accredited investors. Both Rule 506 of Reg D and the antifraud provisions of the federal securities laws mandate that issuers disclose truthful and accurate information to investors, there is no requirement to provide any specific information or disclosures to accredited investors. There are two general approaches to raising capital via private placement: (1) an offering with fixed terms to a relatively large group of potential investors, and (2) a negotiated transaction with a lead investor or smaller number of potential investors. For an offering to a small number of sophisticated (experienced) investors, usually only a term sheet will be necessary. However, for a larger group of investors, a PPM may be required or prudent. In any event, for offerings of more than $5 million to non-accredited investors, you must prepare, draft and deliver a lengthy PPM. In order to help you determine which approach to take, you need to know how much money you need to raise, how you intend to use the capital, how much creative control you want to negotiate to retain, the stage or round of funding, who your prospective investors are, what your potential investors’ past behavior (as investors) is like (such as expectations of potential investors regarding PPMs), the Blue Sky law of each state in which your potential investors reside, and who is selling your securities for you if not yourself (such as a broker-dealer). The decision of whether you need to use a PPM to raise money is rarely simple. But regardless of whether you use a PPM or not, you should prepare detailed disclosure documents in order to avoid liability for misstatements or securities fraud, especially if the nature and operations of your business and/or the terms of the investment offering are very complex. Whether or not a PPM is used, each transaction and offering of securities should be carefully reviewed by legal counsel to determine the minimum level of disclosure that must be provided to prospective investors under applicable federal and state securities laws, and to catch and correct any compliance issues. The most common lender transactions in the film industry do not quite fall into any of the categories described above. They typically are not supported by hard assets, so to speak, rather by distributor contracts. Those transactions may take the form of worldwide negative pickups, domestic and international split rights deals or foreign pre-sales. If the film producer can obtain a distribution agreement and guarantee from a credit-worthy distributor, the producer may be able to use that agreement or those agreements as effective collateral for the loan. Unfortunately, this form of lender financing of feature films is not available for most of the films sought to be produced by independent film producers. While it is common to see the financing plans for projects with budgets $3 million and up consisting of foreign pre-sales, it is not so common below $3 million. Pre-sales agreements are pre-arranged and executed contracts made with distributors before the ﬁlm is produced, and are based on the perceived strength of the project as assessed by each distributor after reviewing numerous factors, including the script, the attached talent, and the marketing strategy. Once you enter the pre-sales agreements, there are two ways to go: (i) you can take out a bank loan using the pre-sales as collateral; or (ii) receive a direct payment at a discount from the distributors themselves. 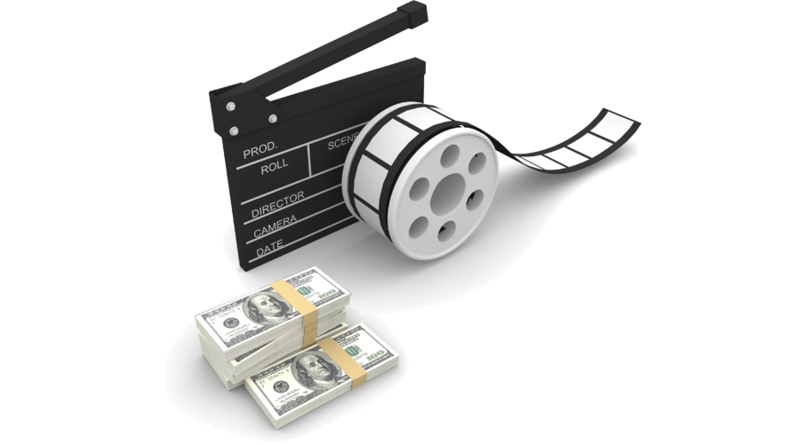 This financing strategies requires the filmmaker to either repay the loan based on the pre-sales or a direct payment from the distributors before profiting on the film, and the filmmaker will likely have to personally guarantee the loan or advance payment in the event the film cannot be completed. Nonetheless, since pre-sell agreements allow the filmmaker to finance a project without personal funds at stake, they remain very attractive to the filmmaker. The pre-sell and distribution deals vary significantly. There are costs involved in putting such deals together. Packagers can take anywhere from 5%-15% of every sale. Sales agents’ fees vary between 10%-25% for obtaining distribution contracts only — and as much as 30%-35% should they secure a cash advance or bank contract. Those that are lucky might be able to use a negative pickup as a type of film financing arrangement. A negative pickup is a contract entered into by an independent producer and a movie studio wherein the studio agrees to purchase the movie from the producer at a given date and for a fixed sum. Depending on whether the studio pays part or all of the cost of the film, the studio will receive the domestic, international, DVD, Blu-ray and/or TV rights to the film, with net profits split between the producer and the studio. By combining a negative pickup, other deals collateral to the production and pre-selling territories not covered in the negative pickup, a producer will usually cover all his costs and make a small profit before production has begun. But financing of the production up to its completion date is the responsibility of the producer—if the film goes over budget, the producer must pay the difference himself or go back to the studio and renegotiate the deal. Most negative pickup contracts, either from motion picture studios or television networks, are bankable at pretty much dollar for dollar (less fees); if one holds a negative pickup contract, one essentially holds a cheque from the studio for the cost of the film, post-dated to the day one delivers the film to them. So, while the studio technically does not pay the producer until the film negative is officially delivered (thus “negative pickup”), the producer can nonetheless get a bank loan against a negative pickup contract, which helps the producer to pay for production of the film. The studios and distributors will contain this risk by offering the negative pickup contract only to a production that has financiers, a script, and key creative personnel, particularly the director and stars, already attached. Thus the conundrum: unless a film has U.S. distribution, a lot of investors and foreign buyers will not pre-buy a film, and unless the film is already financed, the studios do not want to guarantee distribution. This catch-22 is often resolved by attaching a major actor to the film; the mere appearance of an American movie star’s name on a film’s poster is often enough to drive box office to cover distribution in many foreign markets. Because of the complexity of these pre-sales deals, it is wise to consult with counsel before entering into one. Raising debt capital is less complicated because the company is not required to comply with state and federal securities laws and regulations. The company is not required to send periodic mailings to large numbers of investors, hold periodic meetings of shareholders, and seek the vote of shareholders before taking certain actions. These latter two considerations only apply to corporations. Manager-managed LLC and limited partnerships do not require the meetings and investor approval on most issues. Many filmmakers obtain loans for their films, although loans are usually only given once other financing is in place. Usually, filmmakers only use loans to fill in the “gap” or as “bridge” financing between what they have raised and the total cost of the film. With gap financing, banks provide a loan of between 10%-30% of a film’s budget against the value of all the distribution markets that remain unsold. As the pre-sales market continued to soften, the gap has widened further. So-called “super-gap” financing has recently emerged, essentially a riskier form of mezzanine-style financing in which more (up to 35%) of a film’s budget is borrowed against future revenue projections. In return for financing more of the budget, super-gap lenders demand higher interest rates. What happens when your combination of presold minimum guarantees, gap financing, and soft money is still insufficient to cover the financing of a particular project? The answer has been to turn to some kind of private financing. Be careful about debt disguised as equity. Again, debt is usually the last piece of financing you bring in. The game is finding a way of getting your money out soon. It’s a strange psychological thing. What I have discovered in this business is that if you simply call something, ‘debt’, then pretty much everybody says, ‘Yeah, well, you obviously come out ahead of the equity.’ Even if it’s just really basically a piece of hidden equity. Most filmmakers switch that around and look for debt first because it’s easy, but debt financing can’t actually close until all the rest of the financing is present and spoken for. Don’t allow filmmakers to claim they already have the debt piece figured out when they don’t have any financing in place or a pre-sellable movie with estimates. Every company who engages in debt financing is different, but most will want to recoup their loan in first position before equity investors which can be a deal breaker right off the bat depending on what kind of deal you made with your principle financiers. Debt companies also charge interest and fees commensurate with the amount but also the experience of the filmmaking team and who is financing. Their opportunity cost is always deploying funds to the most ‘sure thing’ possible so they take vetting seriously. For this reason, it’s often easier to work with private lenders rather than companies when covering your debt piece since the requirements might be easier to surmount for smaller films and companies. Of course, you have to find these private lenders first but since you’re offering a pretty solid deal backed by a state or country tax certificate, their risk is much lower than if they were making an equity investment. Their potential upside is also lower since they’re only earning interest on the loan and not back end participation, but it’s a great way for someone to diversify into a low risk deal. The bottom line is this – debt is not for everyone and not available to most who think it is. You really have to come at it from the last piece of the puzzle after everything else is in place and you can serve as proof of value and collateral of the loan, the film package must demonstrate to the lender the value of the project. Since filming has not yet begun, the collateral includes tax rebate certificate (that hasn’t been collateralized yet by someone else), the screenplay and story rights; legally binding commitments by the key personnel to participate in the film; the production budget – including a draw-down schedule for the use of the proceeds as they are paid to the filmmaker throughout production; and most importantly, legally binding guarantees for the territory sales, negative pick-up, or other financing arrangement. These contracts must specify the guaranteed minimum the filmmaker will be paid, and that amount can be used as collateral to be pledged against the value of the loan. The challenge with this late-stage private financing is two-fold. The producer is lumbered with high transaction fees, on top of all the bank charges, agency commissions, pre-paid interest, deferrals, and other contingencies that have already taken a bite out of the budget. The investor is also buying into a movie in which all the saleable foreign markets have been disposed of already. The only real asset that remains is the 20% tier of the foreign contracts and subsidy contracts which is not covered by the bank loan. This is also the riskiest tier. If the producer manages to bring the movie in on budget, some of that equity investment can be paid back from the contingency funds released by the completion bond company. Beyond that, the investor must hope that the unsold American rights will find a distribution home. If the film does not earn sufficient return to repay this loan, the filmmaker will be on the hook for the total unpaid loan amount. Another area to make sure that you are protected. Most states (and several countries around the world) provide government aid for the development, pre-production, production, post-production and distribution of film, documentary, television series, commercials, video games and other audiovisual works. Such “soft money” sources include tax credits, tax deductions and tax shelters, cash rebates and grants, film funds and co-production funding. A Tax Shelter is a government-approved tax incentive program whereby a production company can raise production financing from a country’s taxpayers. Producers who qualify for these incentives are offered an average subsidy of 25 cents for every dollar of allowable production expense, a figure that has risen to more than 40 cents on the dollar for shoots in Alaska and Michigan. In addition to state incentives there are also federal tax benefits available as well. If the film is made in the United States, producers may further educate potential investors on how to utilize the tax code Section 181 to reduce their tax burden and hence reduce their risk in financing the project. Like bridge loans, tax credits can be helpful in filling in the gap between the money a filmmaker raises and the budget of the film. Individual states and countries allow film producers to subsidize the money spent on production through tax benefits. Typically, this requires the filmmaker to film a significant portion of the production in a local area, hire a certain number of local crew employees, rent from local vendors, and run payroll through local services. Tax credits are based on a lengthy application process and are often difficult to procure (Ex. NY is 16 to 18 month waiting period on a tax rebate). So, as investors that’s something that you need to account for in terms of recoupment. But, depending on the state or country, the benefits can be significant. For example, a $1 million movie can end up actually costing $750,000. This means that the filmmaker only needs to raise 75% of the film’s budget. In some cases, states allow for tax credits to be traded at a discount to rich people or entities looking to offset their own profits, in which case a percentage of the money is available to the production upfront. Whatever the system is, the attraction of such incentives is obvious: the more that soft money is able to reduce the budget, the quicker the film becomes profitable and the sooner equity holders get to share in that profit stream. “Anyone who makes a film in the US without a tax rebate is a de facto idiot,” proclaimed “Boyhood” producer John Sloss. As with the other forms of financing, due to the complexity of these transactions, its important for a filmmaker to know the rights regarding tax credits. If your production will qualify for tax credits, many equity investors would prefer that the tax credits not be used as part of the finance plan to cash flow production. Therefore, if you’re able to qualify for Government subsidies, that doesn’t necessarily mean you have to increase your budget incrementally. You may use the tax credits or rebates to pay back your investors, rather than scaling up the budget because of it. Therefore, up to 80% of your investor’s investment can be secured by subsidies. These government subsidies can act as a partial safety net for the investor, if and when the movie flops at the box office and VOD. Most investors almost always skip to this. From the onset, it is important to note that there are multiple exit strategies for film investors looking to get back their equity capital. Some don’t even involve waiting until a film is released in theaters or watched on a small screen. Every year, at least one major film festival can point to an independent feature film whose distribution rights are sold on the spot for a multiple of its production budget. This immediate return of capital eliminates the investor’s exposure to performance risk — the ideal outcome for an investor, unless they are keen to play the long game and participate in the upside alongside the distributor. It is very important that a good business plan set out exactly how a potential investor is going to get their money back and make a profit, how much time it’ll take and the order in which investor will recoup its investment. More often than not, a film has to start generating an income stream from its distribution before investors begin to see meaningful returns. For example, in a typical sales cycles, it may take 18-24 months after completion of the film before you can start positive cash flow. Most filmmakers in the independent film world likely have to defer their producer fees and, if other talent will agree to defer their fees, then that much less money has to be raised to make the film. The problem with this method is that the “risk takers” are working for free and relying on the film’s success for payment. Certainly a gamble especially since all deferred fees will likely be paid only after the loans and investors have recouped. Whether a first time or experienced filmmaker/producer, you will probably have to use a combination of the above financing options to make a film. Under any of the above options, the key is to present as complete a package as possible with all relevant, legally airtight attachments, a fleshed out budget and, at least, one experienced person to lend gravitas to the film. You might give financiers some assurance that the film will be made if all of these requirements are met. 6. Finally, you deduct investor’s share of profits (50%). Typically, any third-party talent participants (residuals/participation share) are paid from the producer’s share of profits, except for those participations that are deducted “off-the-top”, that is, before any division between producer and investor. This is a simplified picture. As with all industry-specific corporate financing, there are many structures which can significantly increase the complexity of the returns waterfall. This is why a well-structured business plan is so important, balancing the competing claims on any film in a hopefully fair and equitable manner. While investors tend to concern themselves with limiting their downside exposure, going so far as to insist on significant fees within the film’s budget to help hedge their risk, it’s often the allocation of the upside that can cause greater problems. Even if it can obtain a relatively favorable recoupment position (e.g., ahead of deferrals) and a premium, a lot of money is paid out ahead of the investor. Another key consideration is timing. One of the reasons why investors like to keep budgets low is that this accelerates the break-even point and improves the internal rate of return on that investment. Too big a budget, especially in these times of diminishing pre-sales, and your capital is stuck. There is no structure or mechanism to increase liquidity of film investments, either through clear exit strategies, or secondary capital markets. The dirty secret of film investment is that it is a long recoupment cycle with little planning for an exit strategy. Without a way to get out, fewer people choose to get in. It takes a particular investor to want to lock up an investment for four years. It’s important you work with a seasoned film financing consulting companies and/or law firm prior to moving forward with any film project as a financier.